The member of the national board of the Landless Workers Movement (MST) Jaime Amorim was arrested by the military police in downtown Caruaru, Pernambuco, while he was handing out Brasil de Fato newspapers this morning, and was only released hours later, in the afternoon. Witnesses say supporters of Brazil’s presidential candidate Jair Bolsonaro threatened and attacked the activists who were handing out copies of the BdF special edition on the elections. 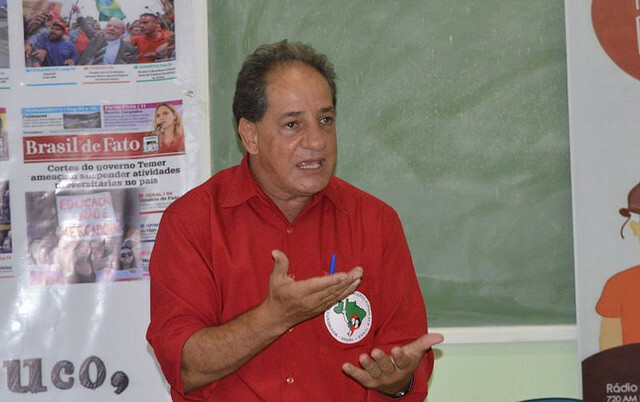 Francisco Terto, from the Pernambuco state board of the MST, said a group of Bolsonaro’s supporters started the altercation. “It was a group supporting the ‘Thing’ [Jair Bolsonaro] in plainclothes, two military officers riding a motorcycle. One of our comrades was handing out the material. They [the officers] were not wearing badges and started to shout swear words. So we tried to talk to them about the risk our country is facing, and they became violent and got out of their bike,” Terto said. After threats, one of Bolsonaro’s supporters identified as a police officer who was on his day off and pulled out a gun, aiming at the activists. Jaime Amorim was insulted and punched in the face. A 17-year-old who was handing out the newspaper was slightly injured. The altercation only stopped after the police came and Amorim and the police officer who attacked him were taken to the police station. The MST released a statement saying the police were trying to keep Amorim in custody claiming he was breaking the electoral law. However, lawyer Patrick Mariano argued there is nothing illegal about handing out newspapers on the eve of the election – even if it were campaign material, that would be legal. “There is nothing illegal or breaking the electoral law. You can campaign until 10 pm tonight,” the lawyer explained. After being arrested, Amorim reiterated how important it is for activists to keep working until the last minute. “The important thing is, we can’t miss one minute. We have to keep fighting for each and every vote,” he said. Brazil’s presidential runoff will be held tomorrow, Oct. 28, between the far-right candidate Jair Bolsonaro and the Workers’ Party presidential hopeful, Fernando Haddad.